I'd heard a lot about Sergei Lukyanenko, and - if the hype was any judge -, Night Watch would be nothing short of sublime. Unfortunately, my enthusiasm didn't quite extend to learning Russian, and so I was forced to wait until a copy - in English - found its way to my door. And it was well worth the wait. Even taking into account the considerable hype around Lukyanenko's work, Night Watch truly is nothing short of sublime. In Moscow, it's not only humans who walk the streets. It's an open premise, indeed. In Night Watch, these are Others, bearing allegiance to Light or Dark - but these are far from the absolutes you'll see in other works. For when an Other first enters the Twilight, that shadowy half-world that only the truly inhuman can enter, his mood - his feelings - force a choice: the Light, or the Dark. The distinction, after all, is far from close cut, as we'll see. But the Others now owe allegiance to a third force, too - a Treaty, between Light and Dark, to prevent the wars of the past. To prevent unrestrained Light and Dark. Now, for every act of "Good", there must be one of "Evil" - and who can enforce this against potential lawbreakers - with magical abilities beyond comprehension? The answer is, or are, the Watches. Night (Light), and Day (Dark), each watches and regulates the Others of the opposite allegiance, constantly in conflict. And playing a role in this conflict, our protagonist, Anton Gorodetsky. An Other of average talent serving in the Night Watch, Gorodetsky's boss, Gesar, has pushed him away from his role as the head programmer for the Watch - because Gesar wants Gorodetsky, there's a rogue vampire on the loose, an Other of incredible power, and a curse that threatens to destroy the city with its victim. But not all plots belong to the Dark. And that, though complex, is only story one - of three. For, at its heart, belying the excitement and the urban flair, is an intensely moral conflict - of what is justifiable, what is necessary. Of inherent qualities, and those earned. And... Well, you'll see. 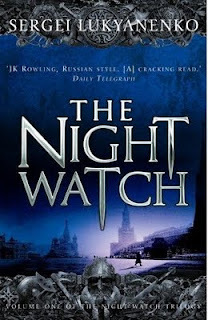 But Night Watch is an unforgettable story, with a not-always-sympathetic protagonist in Anton Gorodetsky - a rare trope -, and Light and Dark where the former's plots are just as deadly as the latter's. To Anton Gorodetsky, our unwilling protagonist, they're more so. Sounds good. I'll keep my eye out. Thankee! I do have to say you really tell a great story. Well, you make this story sound amazing. This is a really great review. I think I need to have this book by this review. Thanks!